The beach season is about to start, The Yucatan State Government has begun to carry out sand filling activities and the removal of groins in some sections that are very representative of the area of summer houses (7 km between Chicxulub and Uaymitún); However, there is still great confusion about groins. Are they good or bad for the beach? The answer closest to reality is still the same: Sometimes they can work but sometimes they can be very harmful. What we know with certainty is that the first alternative should always be to give the beach system an opportunity to recover naturally. As an example, Figure 1 shows the case of an intervention of groins (which is already followed in this series) which cannot be described as anything other than disastrous (km 32 Progreso -Telchac highway). This area is a great indicator since it did NOT receive any sand fill. Simply removing the spurs allowed the system to recover naturally. The second section, shown in figure 2 (km 7.5 Progreso – Telchac highway) presents a beach section with “batteries of groins” and its appearance 6 months after their retirement by the authorities. This case is extremely interesting. Originally, sand was to be poured as part of the project currently being executed. However, the removal of groins (both in this area and adjacent beaches), coupled with the free circulation and settlement of sediments, allowed the natural recovery of this segment. The most attractive part of this section is that if unnecessary structures are not placed (groins or breakwaters), it will be sustainable in the medium and long term. This case exemplifies the misconception that a groin prevents sand from being lost (the sand retained by groins without any control is just wasted sand). On the other hand, the concept that the sand that moves from dry beach to the submerged area is lost sand, is also totally wrong. The sand that is put in circulation in the submerged bars system, is the most efficient action of an intervention of artificial beach recovery. This is because the submerged bars are the ones that protect the beaches and supply sand. Figure 1. Km 32 Progreso – Telchac Highway. Area without sand filling intervention where the only measure must be to maintain the natural conditions. A) Beach with groins prior to their retirement by authorities: sand retention in circulation and immediate deterioration to the West. B) Natural reaction of the beach after the removal of groins resulting from the free circulation of sand. Figure 2. Km 7.5: Project area that did not require sand filling due to the high rate of sand moving in from E-W direction. a) Groins retired by authorities in December 2014. b) Appearance of the beach 6 months later (June 2015). If this section is maintained without structures along the surrounding beaches, its chances of stabilizing naturally and permanently without any intervention beyond dune vegetation, are very high. In specific cases, groin systems and parallel breakwaters should be designed in the critical sections that require them. But if they are not evaluated with a comprehensive perspective, the probabilities of failure and damage the system are enormous. The experience in Yucatan shows this. In fact, part of the problem that has been dragged on for years is that groins are placed as if the beach in front of our properties belonged to us and it was our decision what we could place on the beach and what not. This would be equivalent to considering that the road in front of our house belongs to us and we decide what to do with our sidewalk and street, how we park and if we want to, put a traffic light that we need to enter or exit our house, without thinking about the repercussions in the roadway. The previous example is quite valid when we modify how the sand that passes in front of our property moves, and we retain it without thinking that its free circulation is vital for all the beach system. There is too much to do. Clearly, the efforts made by the Yucatan State Government and the federal authorities over the last 2 years have not been enough. 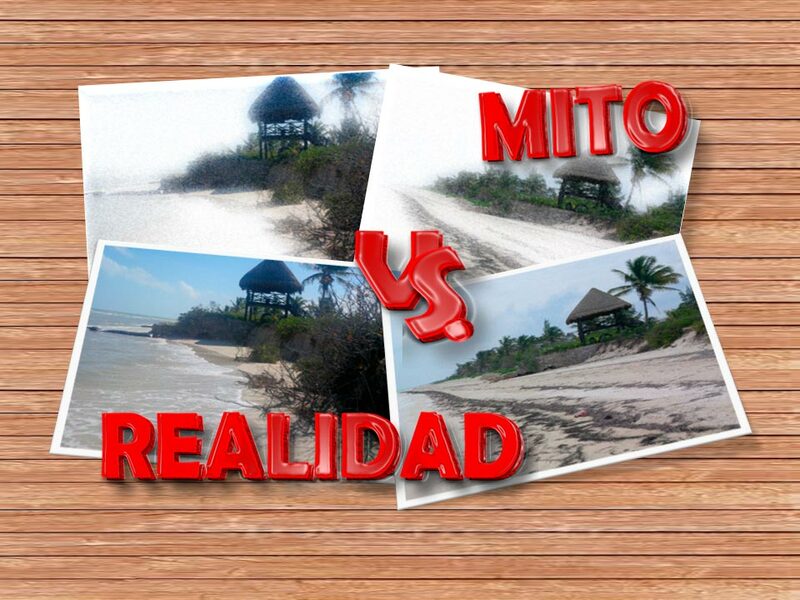 We firmly believe that getting a stable beach system on the Yucatan northern coast by 2018, is an attainable goal. However, all efforts will be insufficient without the support from society. Its contribution is simple: ZERO illegal construction developments. If this does not happen, it will never be clear who is responsible for what does not work, and beaches will continue in intensive care based on specific works that cause more damage to the entire system than what they can repair locally. The only thing that beaches need is for us to leave them alone, only performing actions to recover their natural dynamics. With this article we close the series, we hope it has been of your pleasure, please leave us your comments. If you missed the prequel series, you can read the previous articles here: Part 1, Part 2. We will read each other soon!